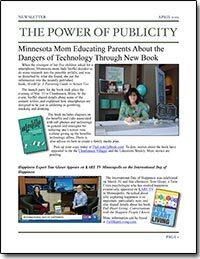 My son, Justin M. Anderson, founder of the teen publishing company Sigma's Bookshelf, and myself were interviewed on KFAI Radio in Minneapolis on Feb. 14. We appeared on the show with Anne Barlow from MN Hands & Voices and "Disability and Progress" host Sam Jasmine to talk about our upcoming Novel Writing Workshop for teens, and the great work MN Hands & Voices does for kids with hearing issues. Justin and I will be working with hearing impaired kids who are interested in writing on Sat., Feb. 16, sharing his story of how he became a published teen author when he was just 14, and how they have the opportunity to do the same thing through Justin's company, Sigma's Bookshelf. If you missed the show, it is now posted online at this link: https://www.kfai.org/program/disabilityandprogress. A book that has been 20 years in the making launched at the Barnes and Noble at Calhoun Village in Minneapolis the evening of Jan. 22, and a second signing took place on Feb. 10 at Common Good Books in St. Paul. Twin Cities author Norm MItchell's The Hidden One is the story of Ashley Cooper. The tale begins in 1962 after the violent death of Ashley’s lover, Olga, who was also his Russian Lit professor, and a Russian émigré from Paris. Before he has the chance to recover from that tragedy, death strikes again. After Ashley’s stepfather, Colonel David Cooper dies, his stepmother, Ronnie, decides the time has come for him to learn the truth about his identity. More information can be found on the Amazon listing for the book, or in the article published in the MN Sun Sailor.